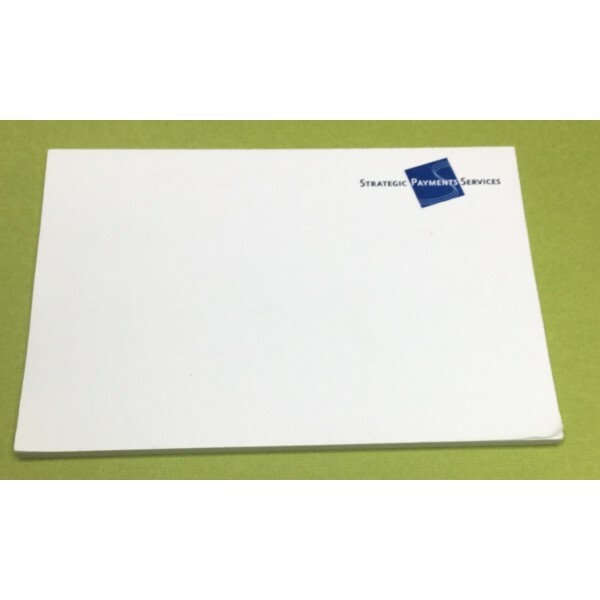 You and your environmentally-conscientious family will love these 125 mm x 75 mm sticky note pads, which are made with 100% recycled paper. The landscape and larger size of these sticky notes makes them idea for jotting down memos, important reminders, or lists. Simplify your life by affixing a sticky note on your refrigerator so that you can quickly and easily jot down grocery items that run out. When you are headed to the grocery store, simply peel off the sticky note from refrigerator and take it with you. Unlike notes that are taped to the refrigerator, the sticky note pads do not leave a residue or gunky mess. Your children can use the distinctive size of these sticky note pads to write down their daily homework assignments-post them up in a visible location when homework is being done and then take down when completed. The sticky notes pads contain 40 sheets of paper that can be printed on, a backing paper as the last page, and an adhesive strip that can be positioned on any one side of the sticky note pad. The price includes the cost of one-colour printing of any supplied image or wording (if desired). We do, however, recommend that the imprint area be no larger than 50% of the page size so that there is maximum writing space for the end-user. GST is not included. Printing is done in Australia and product(s) can only be delivered to customers within Australia.